Sorry about missing last week everyone, but we’re back and we’re covering one of the most beloved cartoons of the last few decades. The Animaniacs, produced by Steven Spielberg is one of the most meta, intelligent, and more importantly funny for all ages cartoons ever produced. At least that’s the way it was when I remember watching it last, let’s see if it holds up to that grand sense of nostalgia. I watched the episodes streaming off of Netflix, choosing the ones with “Yakko’s World”, “The Big Candy Store”, and “Garage Sale of the Century”. Each of these episodes had a focus on different characters that would reoccur over and over again throughout the show’s full run. 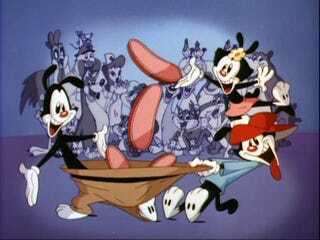 Animaniacs is a sketch show, with a ton of different sketches, usually around three per episode, each one stuffed to the brim with different jokes and wacky hijinks. This article’d be FAR too long if I went through each sketch individually to see if they succeeded or not, so I’m just going to choose one per episode. In the first episode I watched, yes there was Yakko’s World, one of the most famous and enduring bits from the show, but the highlight of the episode was Cookies for Einstein. Showing that the cartoon could handle topics not found normally in kids programming the Warner siblings went to Bern to try and sell scout cookies to Einstein while he was trying to solve the problem of general relativity. Yes, that sentence is the synopsis for the sketch and it is glorious in it’s weirdness. Garage Sale of the Century focused on the siblings going to a garage sale, misunderstanding that the sale is for the contents of the garage and not the garage itself. It’s a simple premise, and it allows for the antics of the siblings to drive the greedy bear running the sale ragged. That however wasn’t the highlight of the episode, the highlight is the sketch focused on the Goodfeathers, the pigeons who speak like cast members of Goodfellas, hence the name. This group of sketches is something I don’t have memories of from when I was a kid, but had me in stitches when watching the goodfeathers trying to reenact West Side Story. The pigeons vs. the sparrows here in a war to protect the statue of Martin Scorsese XD. They literally go through the entire plot of the play in their own pigeony way, again with the central goal being perching on the head of Scorsese. The show is at it’s best when the siblings are involved in wacky antics with a knowing wink to the viewer. Yakko especially is great at this. This episode’s sketch The Big Candy Store is all about messing with the owner of the local candy store. They do a fantastic job of making him unsympathetic so that you don’t feel like it’s a bad thing when the Warner siblings make a total mockery of him and physically put him the wringer. What’s everyone else’s thoughts on The Animaniacs? Love it? Hate it? Think I missed the best episode (insert episode here) ever? Let me know!